Lessons For Our Children Context: Proverbs 22:6-29 “Train up a child in the way he should go: and when he is old, he will not depart from it.” What are. 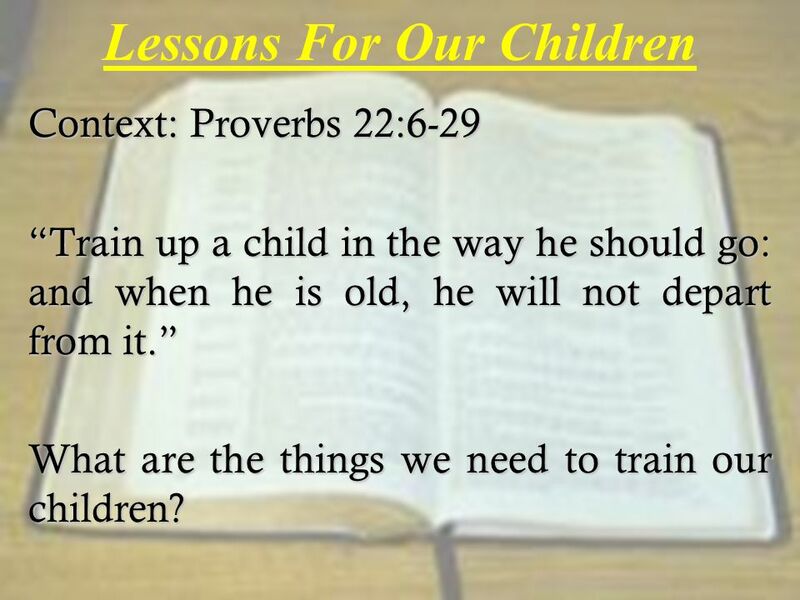 1 Lessons For Our Children Context: Proverbs 22:6-29 “Train up a child in the way he should go: and when he is old, he will not depart from it.” What are the things we need to train our children? 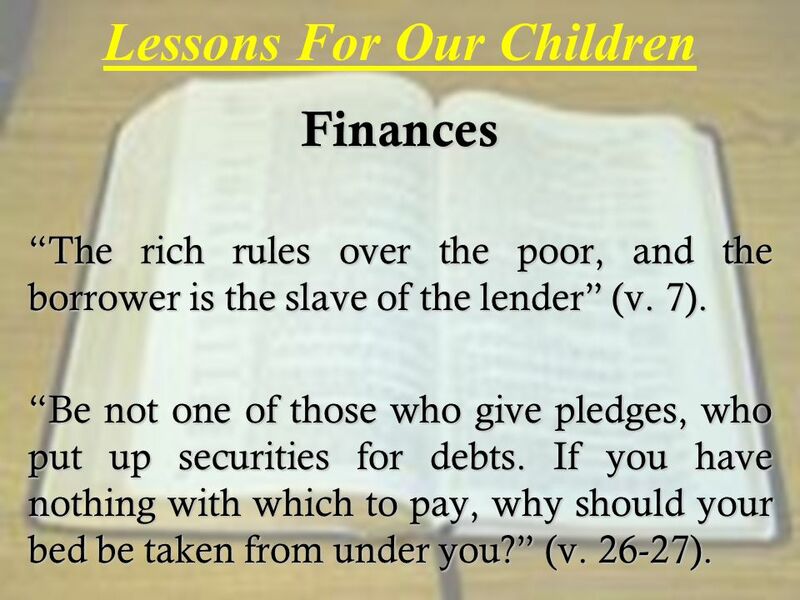 2 Lessons For Our ChildrenFinances “The rich rules over the poor, and the borrower is the slave of the lender” (v. 7). “Be not one of those who give pledges, who put up securities for debts. If you have nothing with which to pay, why should your bed be taken from under you?” (v. 26-27). 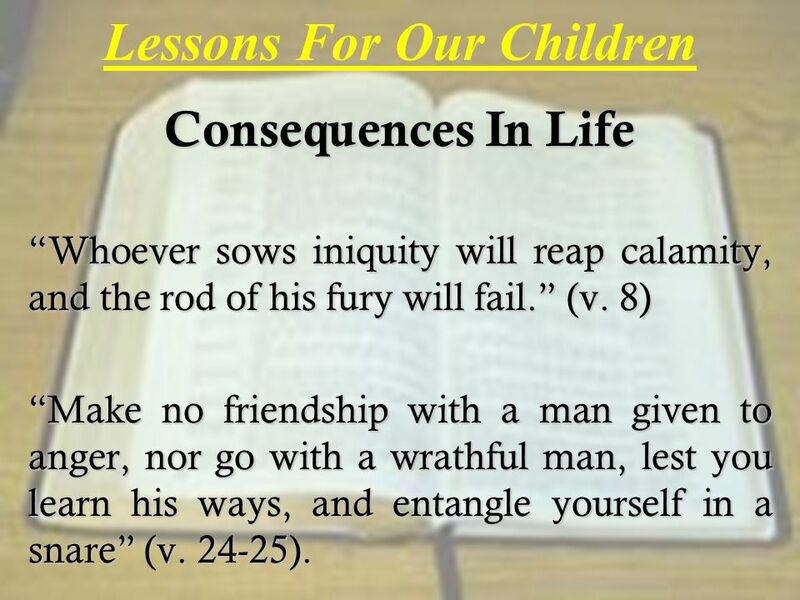 3 Lessons For Our Children Consequences In Life “Whoever sows iniquity will reap calamity, and the rod of his fury will fail.” (v. 8) “Make no friendship with a man given to anger, nor go with a wrathful man, lest you learn his ways, and entangle yourself in a snare” (v. 24-25). 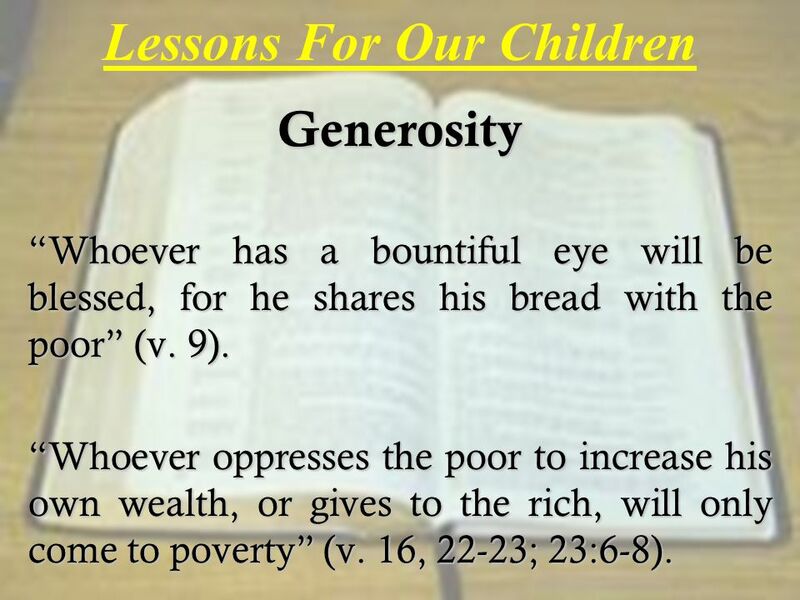 4 Lessons For Our ChildrenGenerosity “Whoever has a bountiful eye will be blessed, for he shares his bread with the poor” (v. 9). “Whoever oppresses the poor to increase his own wealth, or gives to the rich, will only come to poverty” (v. 16, 22-23; 23:6-8). 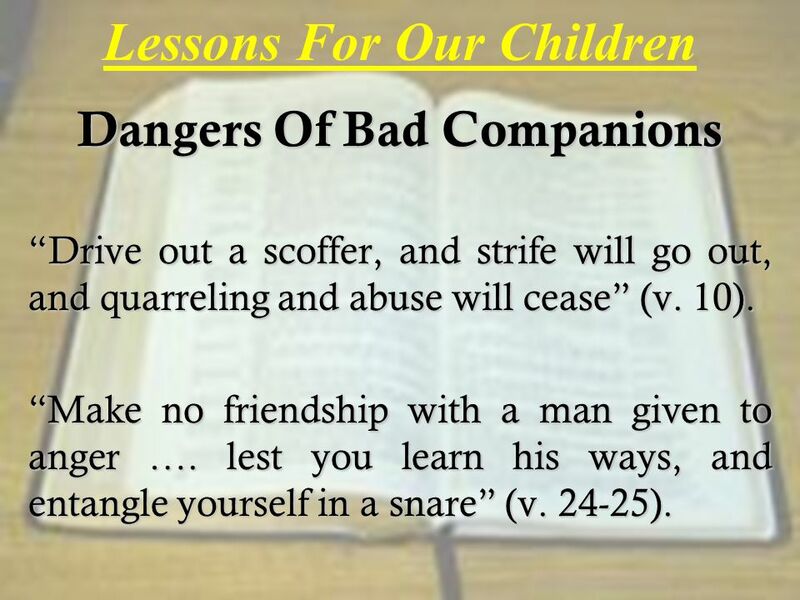 5 Lessons For Our Children Dangers Of Bad Companions “Drive out a scoffer, and strife will go out, and quarreling and abuse will cease” (v. 10). “Make no friendship with a man given to anger …. 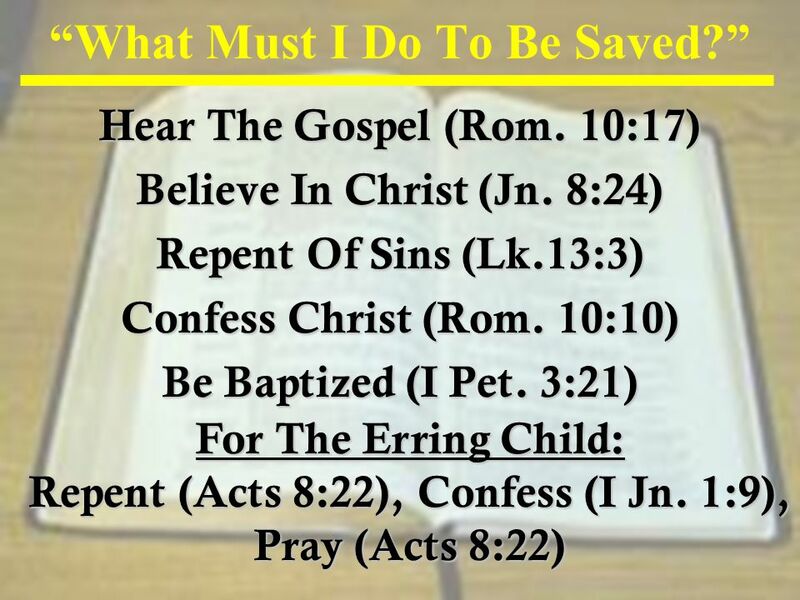 lest you learn his ways, and entangle yourself in a snare” (v. 24-25). 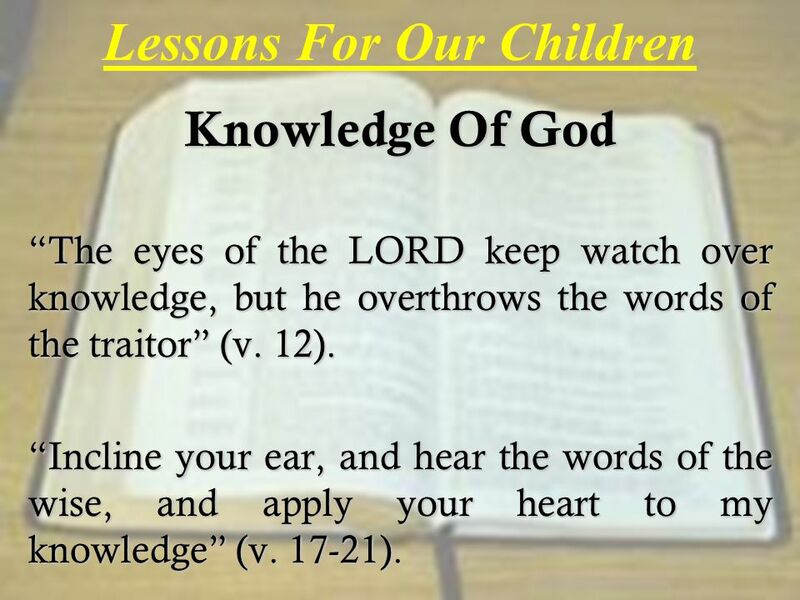 7 Lessons For Our Children Knowledge Of God “The eyes of the LORD keep watch over knowledge, but he overthrows the words of the traitor” (v. 12). “Incline your ear, and hear the words of the wise, and apply your heart to my knowledge” (v. 17-21). 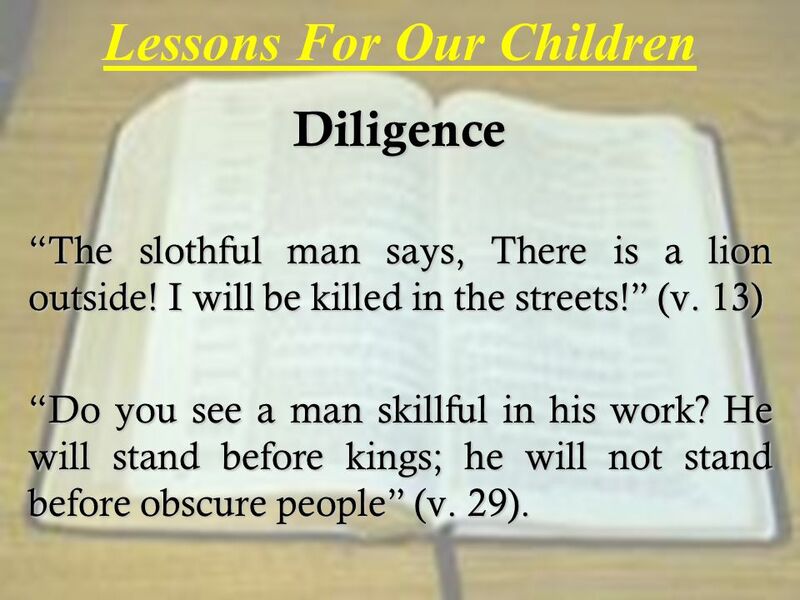 8 Lessons For Our ChildrenDiligence “The slothful man says, There is a lion outside! I will be killed in the streets!” (v. 13) “Do you see a man skillful in his work? He will stand before kings; he will not stand before obscure people” (v. 29). 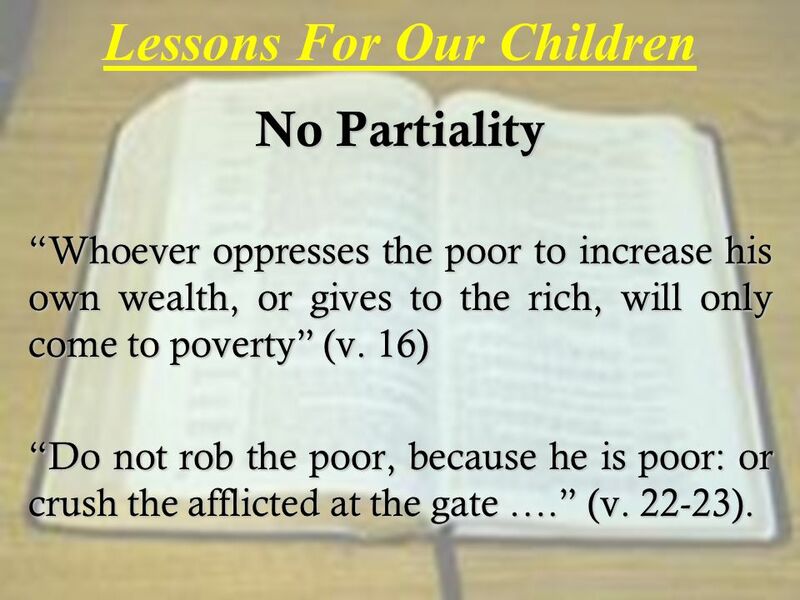 11 Lessons For Our Children No Partiality “Whoever oppresses the poor to increase his own wealth, or gives to the rich, will only come to poverty” (v. 16) “Do not rob the poor, because he is poor: or crush the afflicted at the gate ….” (v. 22-23). 12 Lessons For Our Children Listen/Learn From The Wise “Incline your ear, and hear the words of the wise, and apply your heart to my knowledge, for it will be pleasant if you keep them within you, if all of them are ready on your lips, That your trust may be in the Lord, I have made them known to you today, even to you …. (v. 17-21). 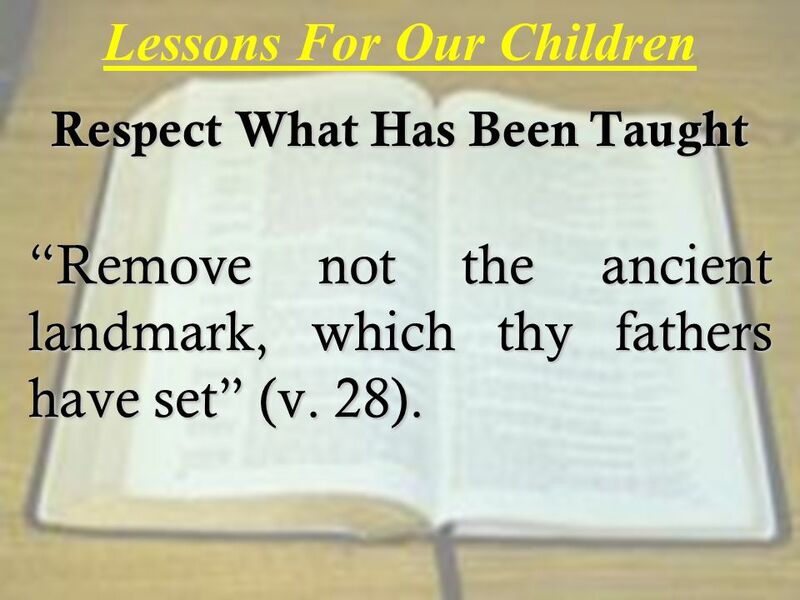 13 Lessons For Our Children Respect What Has Been Taught “Remove not the ancient landmark, which thy fathers have set” (v. 28). 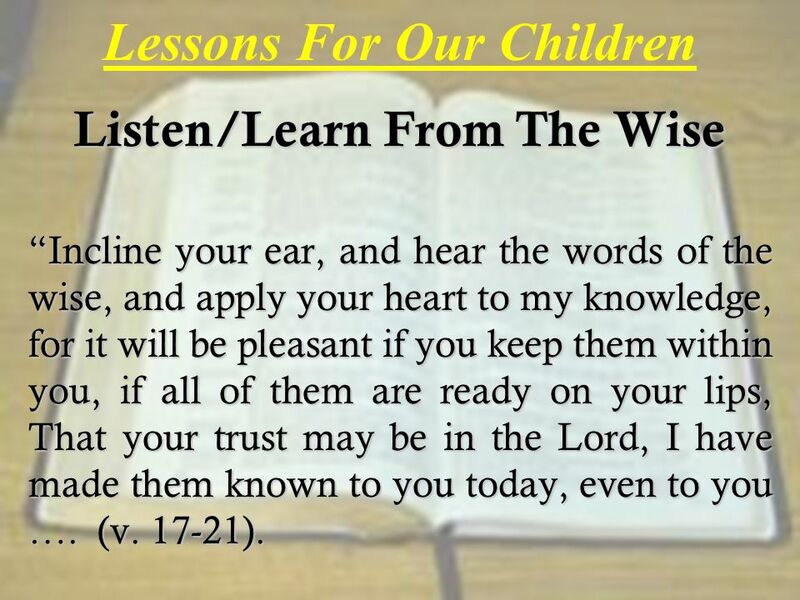 Download ppt "Lessons For Our Children Context: Proverbs 22:6-29 “Train up a child in the way he should go: and when he is old, he will not depart from it.” What are." 1 1 Study of Proverbs Folsom Point church of Christ Q R Clark J Warshaw B Byrd. How to Breed a Fool, Part I The Importance of Teaching Your Children to Be Humble. 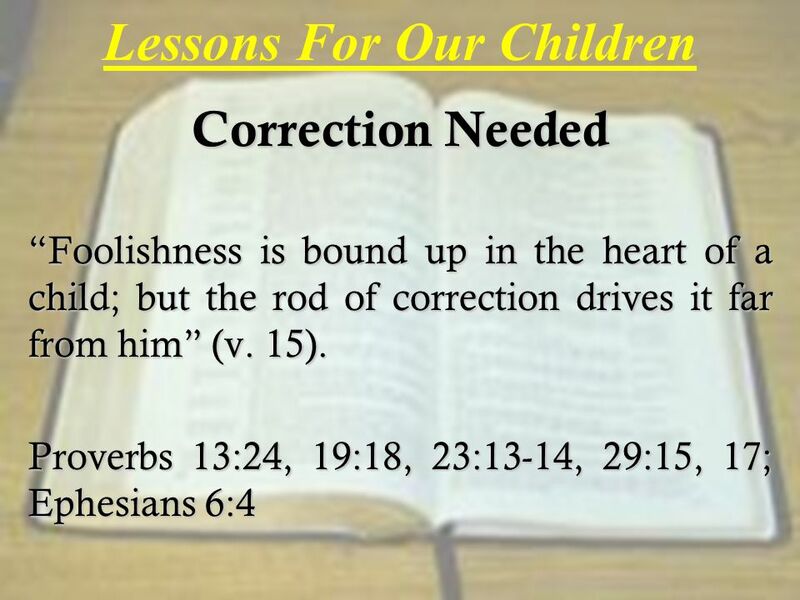 Key point: Foolishness is measured by ones response to instruction and correction. The more one rejects instruction and correction the more he will remain.